But speaking the truth in love, we must grow up in every way into him who is the head, into Christ, from whom the whole body, joined and knitted together by every ligament with which it is equipped, as each part is working properly, promotes the body’s growth in building itself up in love. 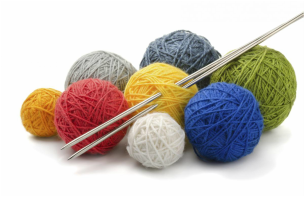 The first and third Thursdays welcome knitters of ALL ages and levels to meet in our church parlor from 10:00 a.m. - 12:00 p.m. to knit (or to learn how!). Knitting projects include making prayer shawls for sick and homebound members and knitting hats for Arkansas Children's Hospital. Anyone who wants to knit or to learn is welcome! In 2014 Knit Wits donated 99 caps to Arkansas Children’s Hospital! If you have never knit before, or need to brush up on your knits and purls, there is always someone at Knit Wits who can give you a hand!